For the best available rate the easiest way to book a room is here directly on our website www.dinglebenners.com, or by calling us on +353 66 915 1638. If you have booked directly with us by phone, or on our website, please contact us via email at reservations@dinglebenners.com with your booking reference number and we will be very pleased to assist. If you have booked with a tour operator or online travel agency, please contact them directly for any modifications. Our cancellation policy may vary depending on the rate you have booked. Should the need to cancel arise, please advise us at least 48 hours prior to your arrival date to avoid any cancellation fees. For special events we operate a 14 day cancellation policy. You may view the cancellation policy as it pertains to your booking in your booking confirmation email. If you have booked directly with us or on our website, contact us via e-mail at reservations@dinglebenners.com and we will be delighted to help you. If you have booked a non-refundable rate or during a time of high volume bookings, the cancellation fee will be the total amount of the booking. When you book online directly with us we take your credit card details to secure your booking. The card will not be charged unless you do not cancel your stay. Otherwise you will pay the full balance of your stay at the hotel. Your booking does not include, room service, excursions or any other service that is not expressly included in your booking confirmation. Please note our extensive cooked and buffet breakfast is included in all of our directly booked rates. Yes of course. If you would like to upgrade to one of our available options please email us at reservations@dinglebenners.com and we will be delighted to help. We are pleased to offer up to 2 children under 3 free sharing with 2 paying adults. If your children are over 3 we have the option of Bed and Breakfast on our childrens rate. Please advise us on booking if you are travelling with children. Our hotel dates back to the early 1800’s, so like many hotels in Ireland we do not have air conditioning in our guest rooms. Yes we provide free car parking for our hotel guests. Arriving by car to Dingle you will enter the hotel to the rear. The front of the hotel is on main street and there is no car parking available to the front. View our map here for directions. How can I get from the hotel to the Dingle Marina by foot? 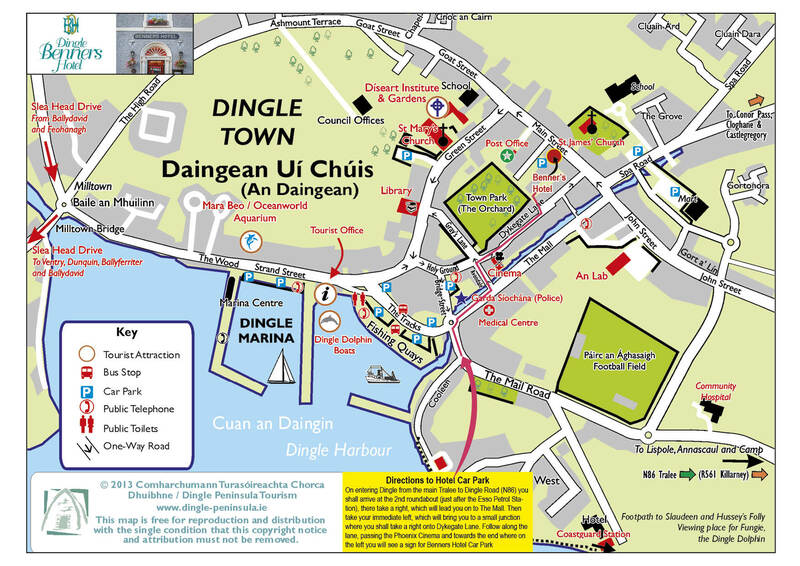 We are located in the centre of Dingle town and are a short stroll to Dingle Marina. Yes, we offer complimentary WiFi throughout the hotel. You will be asked for our password which is available from hotel reception and is printed on your room key card. This does not require your email address to log in. Do you have safes in the guest rooms? No we don’t. We do have a safe at reception that can be used by our guests. For special requests, please send an e-mail to reservations@dinglebenners.com and we will be delighted to help you with your request. We will do everything we can to help you and satisfy your request. Dingle Benners Hotel is an ideal base for exploring Dingle Town. We are a town centre historic hotel offering a calming and restful stay. Is there live entertainment in the hotel? We don’t provide live music in the hotel as there are numerous bars surrounding the hotel which offer live music during the week and at weekends. Yes we provide a laundry service at the hotel at an additional charge. There is also a self-service laundry nearby. We operate a smoke free policy throughout the hotel. You are only allowed to smoke outdoors on the terrace. I would like to offer a stay at the Dingle Benners Hotel as an incentive for my employees. How may I arrange this? You can check into your room at 15.00pm at the earliest and you must check out before 12.00pm. If you wish to check-out later than 12.00pm, contact reception and we will check availability and give you an answer. Late check-outs after 12.00pm are subject to availability and incur a surcharge. What hours is the bar and restaurant open? Mrs Benners Bar opens daily at 12.00pm and offers lunch and dinner. To view our menus please click here. Bookings are not required. We also offer our popular Afternoon Tea and advance bookings are required.